Nothing gets a basketball crowd going more than a dunk, and with Dunkers from Colin Lane Games, you can relive your fantasy of slamming the ball over your opponent in full 2D glory. This isn’t a complex basketball game though, making it suitable for casual fans who want to play in a few short bursts. 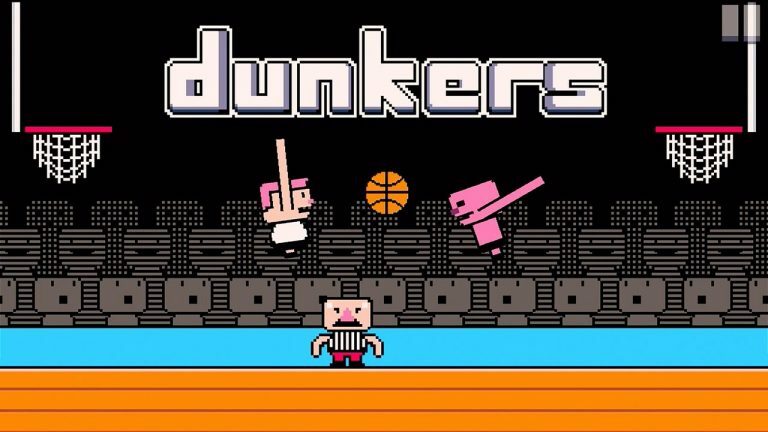 Dunkers comes in three modes: two player, arcade and career mode. Arcade is a standalone mode against the AI. In career mode you’ll be playing in a league, while two player lets you compete against another player. The fact that the game has three modes increases the game’s playability and prevents monotony. Game controls are very easy: there’s a button for direction and a button for dunking and jumping. Tap the direction button to move your player while the dunk button leads to some powerful dunks. A jump ball starts the game and your goal is to get the ball and use the controls to score. Use the controls above to move your player and get to the basket. It may take some time to get used to the controls, but you’ll get used to it. Eventually you will learn how to use the controls to steal the ball. The mechanics are simple and you’ll get the hang of this in no time. Since it is not a full fledged basketball game you can play this in spurts without having to invest a lot of time learning it. If you love basketball but don’t don’t want to play a full game, this is for you.